Anything with Butternut Squash (or any other pumpkin for that matter) always seemed like a typical fall-dish for me. But I seriously have this soup all year round. It’s really easy, full of taste and vitamins and leaves me feeling really full (which I can’t say for all soups). The only part I despise of making this soup, is chopping up the pumpkin. Such a pain! So be sure to make this soup when you’re not in too much of a hurry! Start off by pre-heating your oven to 175 degrees Celsius. 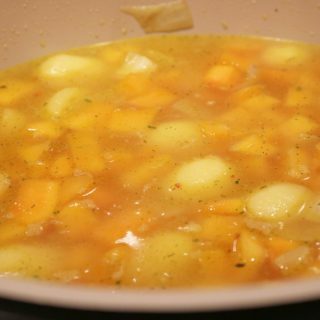 Cut up the butternut squash in cubes and transfer the squash pieces to a bowl. Coat the squash with 2 tbsps of melted coconut oil, garlic powder, salt and pepper. 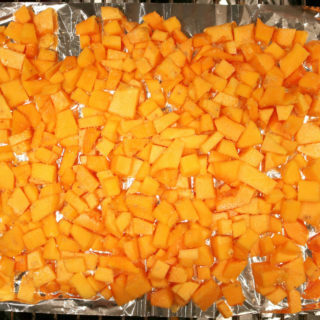 Transfer the squash to an oven tray or by foil lined oven rack and place in the (pre-heated) oven for approx. 10-15 minutes. While your squash is in the oven, cut up your onions, garlic and potatoes. Melt 1 tbsp coconut oil in a large cooking pot and add the onion. When the onion is cooked, add the garlic, potatoes and squash. Allow these to simmer on medium heat for approx. 5 minutes. Now add your veggie broth and cook on low-medium heat for approx 40 minutes. Transfer your soup to a blender. 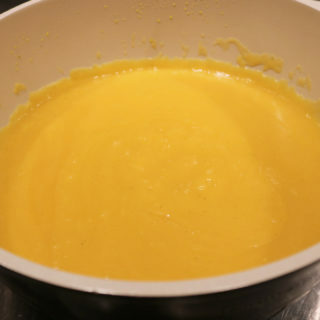 Do this in 2-3 batches; you’ll want to fill your blender halfway, blend the soup, transfer the blended soup to your pan and continue with the other batches, etc. This entry was posted in Healthy Inspiration. Bookmark the permalink. Why are we scared of silence?